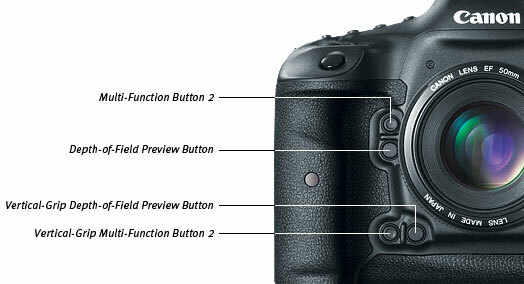 The EOS-1D X has a dedicated AF menu tab, so AF can be controlled without having to go through custom function menus. It also has 6 AF point selection methods (Spot, Single Point, Single + Adjacent 4 Points, Single + Adjacent 8 Points, Zone Selection, and Automatic AF Point Selection), plus a dedicated AF configuration tool for control of AI Servo AF III tracking parameters (tracking sensitivity, acceleration/deceleration tracking, and AF point auto switching). With Firmware Ver. 1.1.1 installed, AF points in the EOS-1D X’s viewfinder can be illuminated in red when the shutter button is pressed halfway during AI Servo AF mode, for easy viewing of the selected point. This valuable feature will enhance the photographer's ability to aim the camera accurately in low-light conditions, and when photographing dark subjects. Addressing the requests of the pros, the EOS-1D X captures HD video with an unprecedented level of sophistication for a digital SLR. It offers both All-I and IPB compression, supports H.264/MPEG-4 AVC High Profile, and automatically splits files greater than 4GB (FAT specifications) for extended recording up to 29:59 minutes without interruption. It offers the option of timecoding only during recording (Rec Run) or at all times (Free Run) - useful for multi-camera shoots. The EOS-1D X offers easy operation with the new Live View shooting/Movie shooting button. Menu options can still be set even when the Live View image is displayed. A dedicated menu tab for video capture allows functions to be changed quickly on the fly. Improved sound recording adjustment capabilities offer 64-step volume control; and a sound recording level meter that is accessible through the Quick Control screen during video shooting. With the Silent Control function, adjustments can be made quietly with a touch pad located on the inner portion of the Quick Control Dial. The built-in wind filter helps suppress unwanted wind noise that can distort or muffle sound. 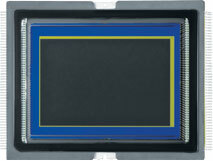 The CMOS sensor's new drive system significantly increases image processor performance, reducing color artifacts and moiré. For professionals who demand nothing less than the best, the EOS-1D X is designed to perform superbly, even in the most treacherous environments, every time. The body is constructed of rigid, high-strength magnesium alloy for rugged performance and features a new grip design for easier finger placement and reduced hand fatigue. Its newly redesigned shutter has lightweight and carbon-fiber blades, and is rated to maintain up to 14 fps performance without compromise, for up to 400,000 cycles. 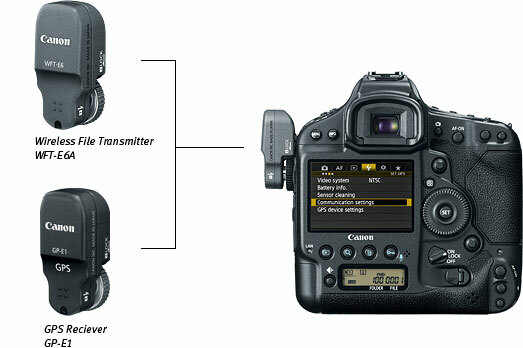 The EOS-1D X and accessories like the new Wireless File Transmitter WFT-E6A and GPS Receiver GP-E1 have extensive gasketing for improved dust and water resistance, even at their connection points. The EOS-1D X's Intelligent Viewfinder offers a sharp, bright approximately 100% field of view with an approximate magnification of .76x, a viewing angle of 35° and a 20mm eye-point. With a new construction featuring aspherical lens elements, the viewfinder displays less distortions and color aberrations than previous models. It uses a transparent LCD to superimpose a customizable combination of focus points and gridlines directly over the image. 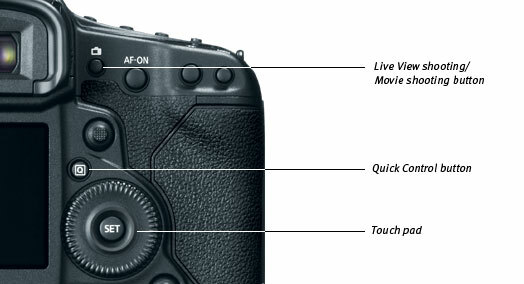 The AF status indicator can even be directed to display within or outside of the viewfinders image area. With the intelligent viewfinder, unlike with other cameras, the photographer has the choice of seeing shooting information or looking only at the scene in front of the camera. The ability to effectively erase all shooting data and turn it back on with the touch of a button gives the photographer the opportunity to concentrate simply on looking and composing the photograph without distraction, a great advantage in numerous shooting situations. To complement the high-speed drive and record the maximum number of shots as quickly as possible, the EOS-1D X records solely to industry speed-leading CompactFlash cards and features Dual Card Slots. Supporting UDMA mode 7, with a maximum data transfer rate of 167 MB/s as well as exFAT maximum file sizes, the EOS-1D X can use Type I and Type II CF recording media. 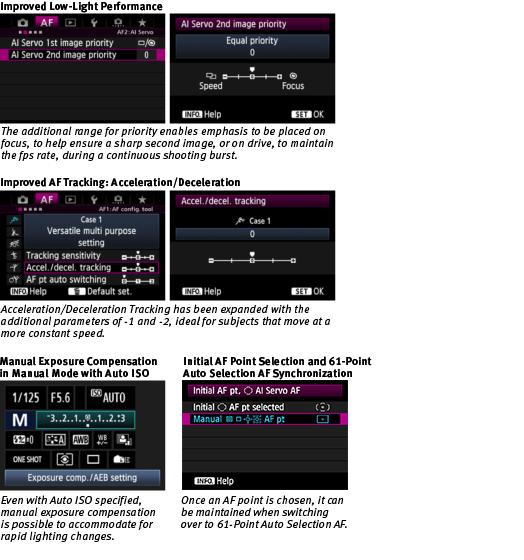 Three recording settings are available: Auto switch, wherein the camera automatically switches from one card to another when the first is filled, Record Separately where the same image is recorded to each card, but in different size or file type, or Record to Multiple, where the same image is saved to both cards in the same size (or sizes), providing an instant backup for added security. Additionally, images can easily be transferred from one CF card to the other. 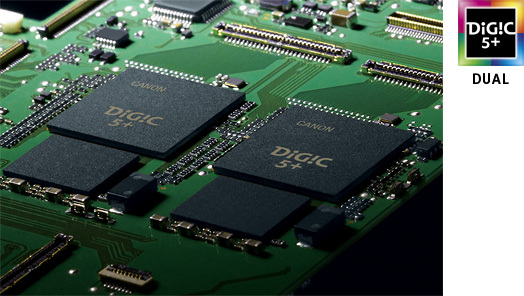 Wired image transfer is also speedier than ever thanks to the EOS-1D X's built-in Gigabit Ethernet terminal (1000BASE-TX). Thanks to a non-contact charge and more resilient design, shutter lag with the EOS-1D X is reduced to 55ms (down even further to 36ms via custom function). A redesigned mirror that uses more effective material to absorb impact when moving up and down not only aids in speedy shot-to-shot times, but the reduced mirror vibration provides more stable shots at all times. 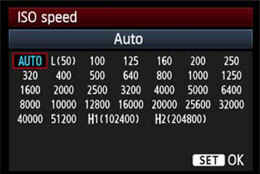 Chromatic aberration in Canon lenses can be corrected at the time of shooting with the EOS-1D X's Lens Aberration Correction feature and can be saved and registered to the particular lens. The EOS-1D X can even distinguish between different lenses of the same model by supporting registration of serial numbers specific to each lens. The EOS-1D X offers a number of multiple exposure options for creative photography, in-camera. It can take from two to nine exposures to create one multiple exposure image, with four distinct settings for exposure control: Additive (where, like with a traditional film-based multiple exposures) the total exposure amount adds up as the exposures are taken (thereby requiring manual exposure compensation for each frame); Average, where the exposure is controlled automatically; (Comparative) Bright, a setting suited for uniformly dark scenes with distinct bright subjects; and (Comparative) Dark, which is suitable for eliminating bright sections or reflections. 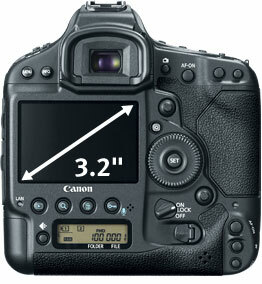 Images can be checked on the LCD during shooting. An existing image can be chosen for the first exposure and the EOS-1D X offers a number of other settings for highly controlled multiple exposure photography of the highest caliber. 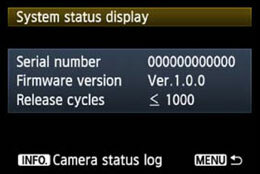 The new Firmware Update Version 2.0.3 for the Canon flagship EOS-1D X DSLR camera is a multi-faceted update that improves operation across the board. Incorporating feedback from professional users, Firmware Update Version 2.0.3 improves AF accuracy in low-light situations and enhances user control of AF shooting parameters. It also enables more control of exposure and allows for more precise user customization, helping to ensure performance tailored to the user’s needs. Combined with the camera’s highly durable construction, Firmware Update Version 2.0.3 helps ensure the EOS-1D X is ready for anything – an ideal professional tool optimized to help bring out the best in any photographer. Firmware Update Version 2.0.3 is available now. Click here to learn more about the new firmware. Click here to view sample images and videos captured using the EOS-1D X Digital SLR. Read more about Canon autofocus systems including the differences between "viewfinder AF" and "Live View and video AF" in the article, "How Does Traditional SLR AF Work? ", found on the Canon Digital Learning Center. * Available on EOS-1D X with Firmware Update Version 1.1.1 or later. ** The maximum continuous shooting speed is restricted to 10 fps when the battery charge is less than 50% or when ISO speed is above 32000. If the camera's internal temperature is low and ISO speed is above 20000, the maximum continuous shooting speed is restricted to 10 fps.